The art of plating has never looked this good. 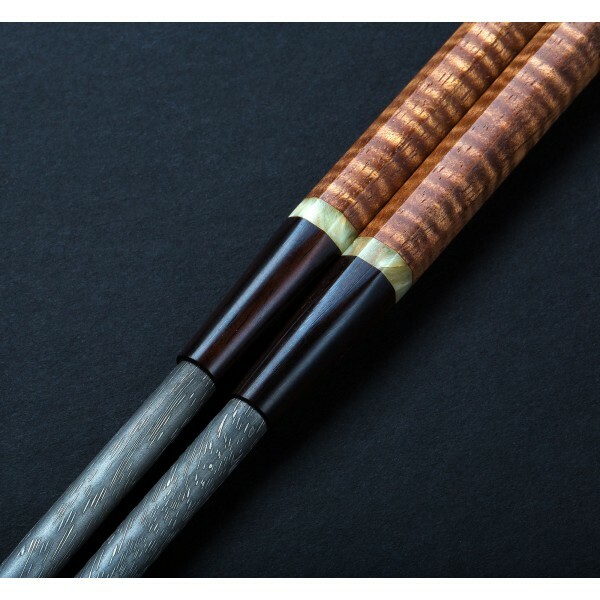 Handmade in Madison, Wisconsin, Dot Matrix pattern stainless damascus steel from blacksmith Rob Thomas, koa wood handle, musk ox spacer and African blackwood ferrule set this one-of-a-kind pair of moribashi plating chopsticks apart from the crowd. Use them to serve at the table and your guests just may forget about the food for a moment. Artist and designer Isaiah Schroeder creates luxurious, gourmet cooking tools and accessories at his shop in Madison, Wisconsin. 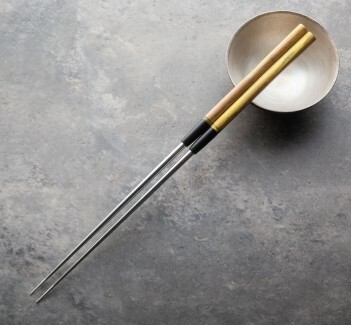 Beginning with custom wooden handles and sayas for kitchen knives, Isaiah and apprentice Alton Janelle now produce a variety of tools including wall magnets, wholly house-made chef knives and of course these gorgeous moribashi plating and serving chopsticks. Rob Thomas 'Dot Matrix' stainless damascus steel. Koa wood handle with musk ox spacer and African blackwood ferrule. By way of background, I use chopsticks almost daily. 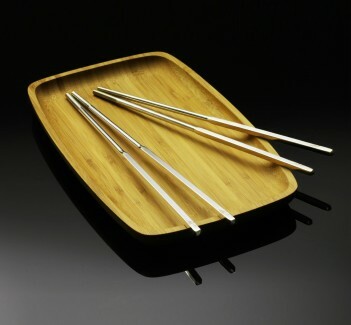 And, despite using many different types of chopsticks over the years, I had always fallen back to the bare basics of Chinese-style bamboo chopsticks for cooking and Japanese-style melamine (aka thermoset plastic) for eating. 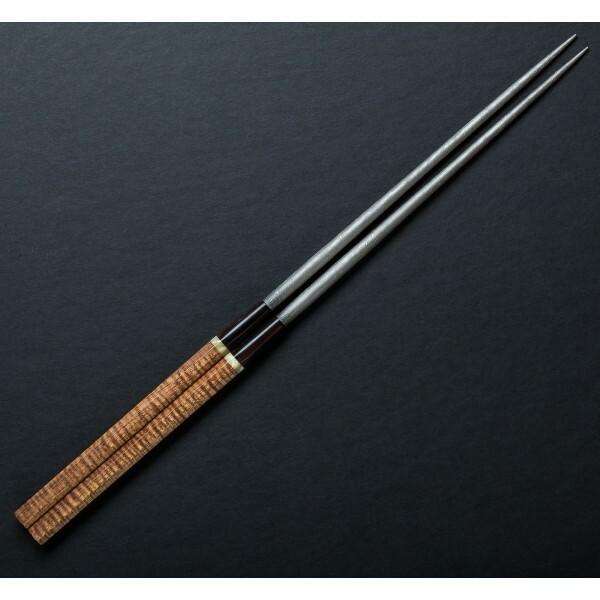 So, if you had told me that I would happily spend a couple hundred dollars on a pair of plating chopsticks . . . well, I would have laughed uproariously and then rolled my eyes. 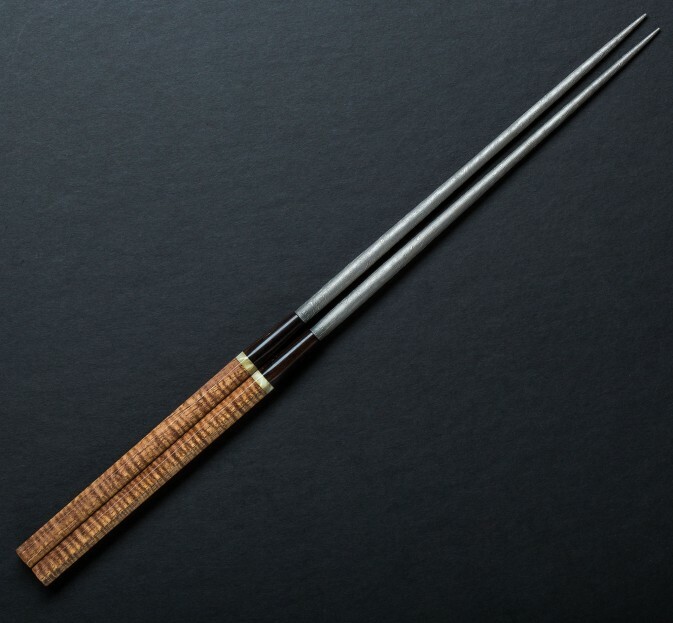 But these Schroeder serving chopsticks are the kind that can amaze your friends and dismay your enemies. And it's not simply because they are a bit expensive. 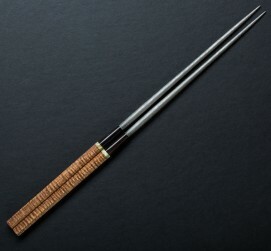 After all, you can buy gold or high-grade jade chopsticks and spend far more.  What really stands out here are the aesthetics and the workmanship. Just beautiful.